The ultimate stompbox for creating atmospheric sounds. Quality sound. Adjustability. Capability for comprehensive foot control. Software can be upgraded. Space offers a huge range of onboard effects. A wide range of knobs give you the power to edit various reverb effects. The HotSwitch is easy to use. Eventide's TimeFactor, ModFactor and PitchFactor, all stompboxes featuring the company's range of studio effects, have delay, modulation and pitch covered, leaving not many other places to go. So, is Space the final frontier? Following the same format as its predecessors, if not their naming, (VerbFactor would have sounded more like a wordplay-based TV gameshow), Space puts a whole bunch of hugely adjustable reverb effects into a single floor unit with a large array of knobs, a trio of onboard footswitches and the socketry to add more. 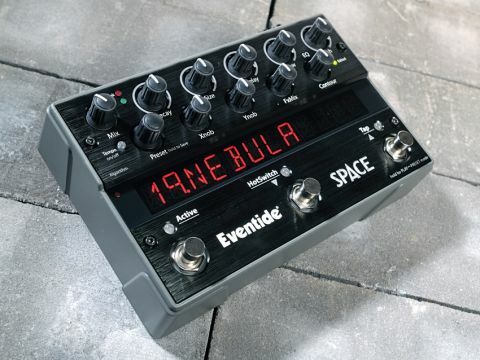 "If you want a stompbox for reverb and other ambient effects, Space is the most comprehensive around." What you get with Space is 12 effects from the Eventide H8000FW and Eclipse V4 rackmount processors. Some of them are pure reverb, but others are combinations where it's paired with delays, pitch-shifting, tremolo, modulation and spatial effects. These are stored in 100 editable presets, including many crafted by respected record producers and engineers, and some created by Living Colour's Vernon Reid. Three footswitches control the action - the left-hand switch always turns the effect on and off, while the other two have different functions, depending on the mode you're using the pedal in. In Play mode, the right-hand switch takes on a tap tempo function, while the centre button is the HotSwitch. Press this and you can call up a pre-defined parameter shift for whatever program is active - it can be like having two different sounds available at all times. It's easy to set up the HotSwitch values, too - you just press and hold the button and turn the parameter knobs to their required values. In Preset mode (engaged by holding down the right footswitch), the centre and right buttons respectively scroll up and down through the onboard presets so you can move from one to the next. Overall, it's a pretty flexible set-up for live use and you have the option of adding up to three further footswitches, which can be programmed to perform a number of functions, and an expression pedal for real-time parameter change. The sounds cover all ambient eventualities. The hall, room, plate and spring algorithms offer very high quality straight reverb effects, while DualVerb combines two reverbs in one effect, as does reverse - one of them being backwards for a touch of weirdness. The rest provide various combinations. ModechoVerb features swept, flanged or chorused reverb tails with echo, MangledVerb brings distortion and detuning to the original effect, while DynaVerb uses compression for dynamic control of the reverb so it can swell up at the end of phrases rather than swamping the whole sound. A trawl through the presets reveals the programmers getting creative with all 12 themes - as you can yourself - and each of the sounds onboard is tweakable to a massive degree via the array of knobs. While most of these are labelled to reflect the usual parameter adjustments you'd expect of a reverb unit (decay, size, delay and so on), the variable they control depends on which algorithm you're using. These, though, are all graphically illustrated on an A4 sheet as well as in the manual, so you shouldn't get too lost. Okay, reverb is perhaps one of the less common effects that guitarists crave underfoot, but it's something that can transform your sound with wise use and, from emphasising some surfy twang to creating a huge soundscape that hangs in the air, this is one pedal that can do it all. If you want a stompbox for reverb and other ambient effects, Space is the most comprehensive around. End of story. Of course, you'll be left with a wallet almost £500 lighter and that is one heck of a lot of money to spend on a single pedal for onstage use with guitars. However, if you have a home studio, you'll get tons more out of this in stereo. To put it in context, rather than compare the asking price to other stompboxes, think instead of how much a rackmount reverb processor or the best quality plug-ins cost, and suddenly it doesn't seem that bad a deal, especially when Space sounds so good.